Affordably outfit interior doors with this knob set from Defiant. The Hartford passage knob easily mounts to doors 1 3/8-inch to 1 3/4-inch thick with the included hardware. Perfect for all hall and closet doors. Provided with this set is an adjustable backset and interchangeable faceplates for drive-in and traditional installations. This sturdy knob nicely coordinates with other fixtures in your home for a cohesive look. A lifetime warranty ensures that this device will withstand frequent use. Featuring a Lifetime Guarantee, DEFIANT meets or exceeds ANSI Grade 3 Standards for residential use. The Powder coated finish will provide years of durability. When used as a replacement lock only a screwdriver is need to make installation a snap. Ideal for Closet and French doors. 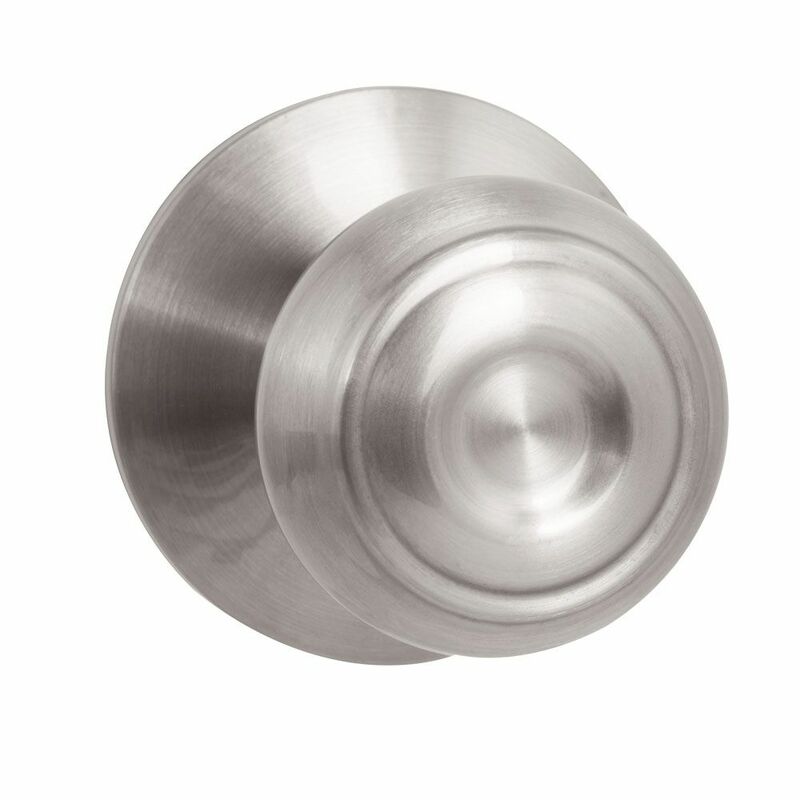 These bi-fold door knobs are constructed of diecast and come in a satin nickel finish. They feature a wide 15/16 inch outside diameter base which prevents crushing of door panel when installed on hollow core doors. Other features of this knob include a large 1-11/16 inch diameter pull for easy gripping and a 1-3/8 inch reach. These knobs are sold 1 per package with 2 fasteners, and they are used by many wardrobe door manufacturers. Hartford Satin Nickel Passage Door Knob Affordably outfit interior doors with this knob set from Defiant. The Hartford passage knob easily mounts to doors 1 3/8-inch to 1 3/4-inch thick with the included hardware. Perfect for all hall and closet doors. Provided with this set is an adjustable backset and interchangeable faceplates for drive-in and traditional installations. This sturdy knob nicely coordinates with other fixtures in your home for a cohesive look. A lifetime warranty ensures that this device will withstand frequent use. Hartford Satin Nickel Passage Door Knob is rated 4.4 out of 5 by 27.